All new Toyota Highlander Hybrid models include the features shown below. Additional equipment and option upgrades are available. 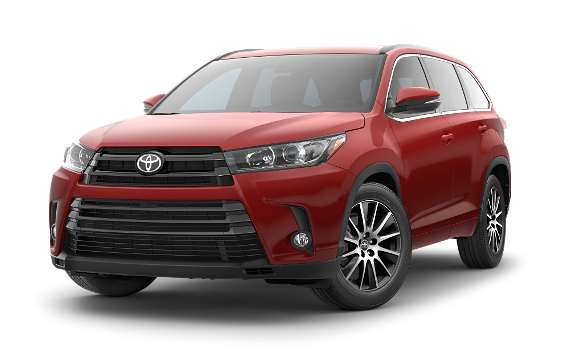 If you need specific answers about Toyota Highlander Hybrid Trim Packages, Upgrade Options or Available Inventory, please Contact Us today. 6 SiriusXM audio services require a subscription sold separately, or as a package, by Sirius XM Radio Inc. If you decide to continue service after your trial, the subscription plan you choose will automatically renew thereafter and you will be charged according to your chosen payment method at then-current rates. Fees and taxes apply. To cancel you must call SiriusXM at 1-866-635-2349. See SiriusXM Customer Agreement for complete terms at www.siriusxm.com. All fees and programming subject to change. Not all vehicles or devices are capable of receiving all services offered by SiriusXM. Current information and features may not be available in all locations, or on all receivers. ®2018 Sirius XM Radio Inc. Sirius, XM, SiriusXM and all related marks and logos are trademarks of Sirius XM Radio Inc.
1 2018 EPA-estimated mileage. Actual mileage will vary.2 Meets Tier 2/Bin 3 Federal emissions standard. There’s now a Highlander Hybrid for every type of family. The 2019 lineup has been expanded to include a hybrid version of Highlander LE, XLE, Limited and Limited Platinum.